Cut off the top of the head of garlic, wrap the bulb in aluminum foil, and roast it on a baking sheet for 30 to 40 minutes, until tender. Allow the bulb to cool and then squeeze the garlic pulp out of the husks. (This should yield 2 tablespoons or more of roasted garlic.) Set aside. Heat the oil over medium-high heat in a large saucepan. Add the green onions and red onion and sauté for 5 minutes, until the onions are translucent. Add the celery, zucchini and parsley and sauté for 5 more minutes. 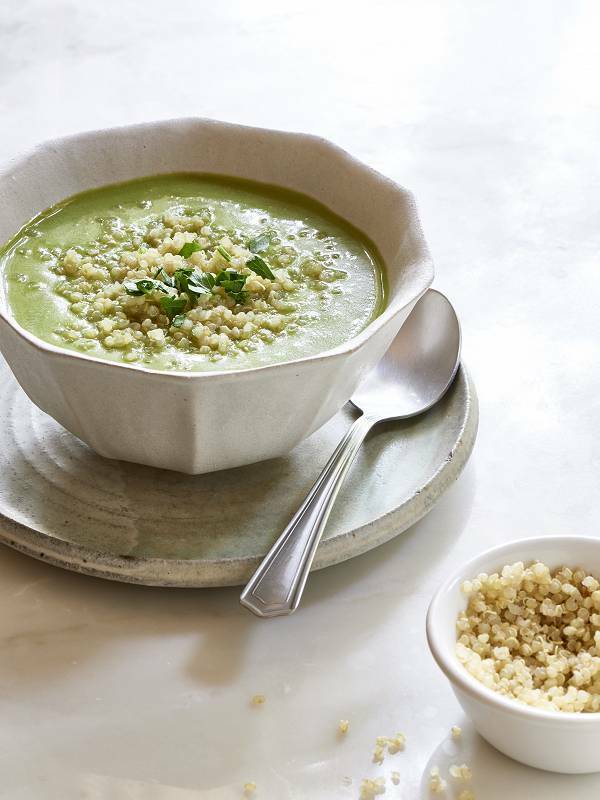 Pour the soup into your blender in batches and pureé on high for 1 to 2 minutes, until smooth and creamy. Return the soup to the saucepan and warm over medium-low heat. Season to taste with pepper and serve.